Talented photographer Jim Reed takes risks most of us wouldn't even dream of to capture spectacular pictures that take your breath way. Covering disasters such as Hurricane Katrina and Hurricane Ike, Reed's book, 'Storm Chaser: A Photographer's Journey' documents his time in the exciting and dangerous field of documenting extreme weather on film and storm chasing. 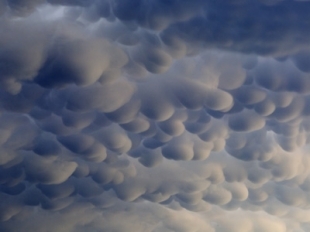 In this picture: Mammatus clouds develop on the edge of a severe thunderstorm in northern Oklahoma on June 16, 2005.